The AttenuTech® Transfer Board bridges the gap between two patient transfer points. The Transfer Board is made of flexible plastic. It is comfortable to sit on and is easily removed after use. Available in 23" and 30" lengths. Weight capacity 300 lbs. 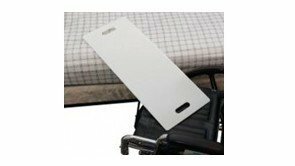 Transfer Board helps the patient transfer between surfaces of similar or slightly different heights. If you have decreased upper body strength, work with a caregiver to help you transfer. Using the industry standard of “a third, a third, a third”, place one third of the board on the surface you are transferring from, place another third onto the surface you are transferring to, and the remaining third is the space in between the two transfer points.